I have nothing against Christians. Really. Some of my best friends and closest relatives are regular church-goers. I think there’s a lot of beauty in Christianity, and indeed in all religions. In fact, I was up all night reading the Old Testament, a copy of which is always to be found in hotel rooms in which I stay. (I’m a particular fan of Leviticus). I think what many of us object to is the extent to which Christianity in North America has been hijacked by agenda-stricken power-mongers on the extreme Right: disingenuous, hurtful bastards like Jerry Falwell. Much as we should not judge all of Islam by neither the actions of a violent few, nor by the ravings of pundits who enjoy the sounds of their voices, we should not belittle Christianity because of the ravings of bigoted, xenophobic Americans who no doubt would have been rejected by Jesus himself. We should remember that many of the institutions of Western civilization, especially British law –from which Canadian, Australian and Indian law, to name but a few systems, arise– are based upon Biblical tenets. Guyana is, of course, a very Christian nation. It’s also a nation beset with violent crime, corruption, domestic abuse, rampant sexual promiscuity and untraditional family arrangements: hardly hallmarks of a stereotypical Christian society, right? In my experience, the more vocally a society exclaims its religion-based morality, the more likely that morality is shallow and fragile. This appears to be true for all religions and all societies. I’m also reading a booked called The Laws of Karma, which is a Hindu scholarly text that begins with the observation that India, as the world’s largest Hindu nation, also most evidently manifests qualities and values that are the least Hindu. Irony, or a natural characteristic of a society? I would argue the latter. I lost my hotel keys a day ago. I upended my room looking for them, to no avail. 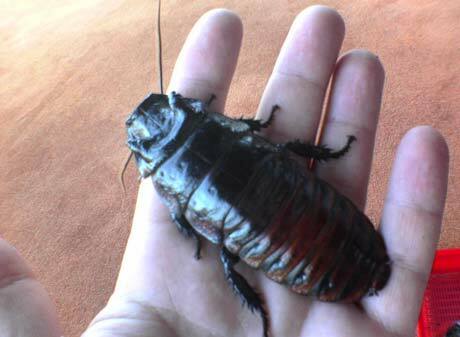 Late last night, as I drifted slowly into slumber, I jerked suddenly awake as I caught sight of a monstrous cockroach descending from the ceiling. The thing was the size of my head. It was big enough to have voting rights. I chased it round and round, till it fled behind a credenza. I pulled the credenza aside to find the roach sitting atop my missing keys! Perhaps, I reasoned, the roach had been sent as an emissary of God to show me my missing keys. Indeed, in my sleepy stupor, I perceived a celestial glow about its hissing form, confirming for me its possible heavenly origins. So I grabbed my shoe and bashed its disgusting brains in. And I slept quite soundly in roach-free bliss, thank you. In other news, a development relevant to work here in South America is news that we are inching closer to the establishment to a “Bank of the South“, as a South American alternative to the World Bank. This project is championed by the governments of Venezuela (unsurprisingly), Brazil, Argentina, Paraguay, Ecuador and Bolivia –all debtors to the World Bank who have, in recent remarkable years, either minimized or eliminated that debt. Unsurprisingly, the IMF is not pleased with this development. Questions of function aside, let us acknowledge that remittances and interest paid by these countries are sources of income for the World Bank. Without them, the World Bank may need to restructure its internal finances… this on the heels of revelations about bloated salaries and nepotistic remuneration packages. It’s certainly an exciting time for South and Latin America. I leave you with this article forwarded by EK Hornbeck, which gives further fuel to what I’ve been stating on this site for six years: Al Gore will run in 2008, and he will win.